Then, a fellow by the name of Klose (you may have heard of him) decided that he could do better. 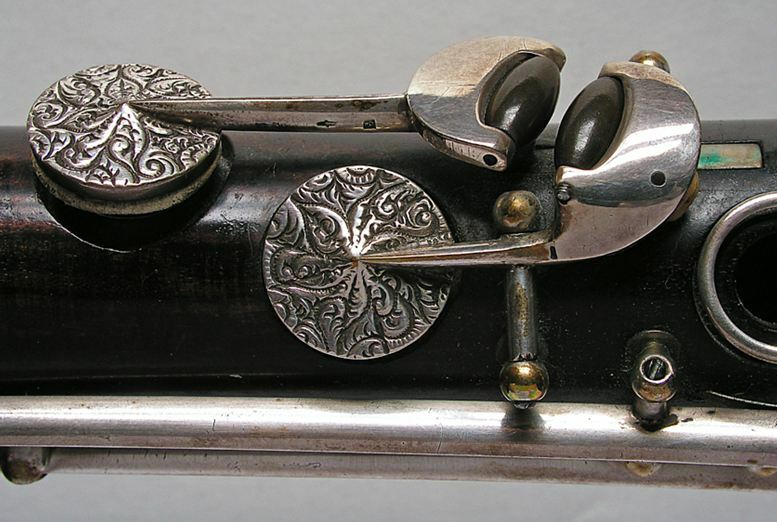 He reworked the Muller clarinet, adding the system of axles, rings, and relocated tonehole openings that was pioneered by Boehm, the flute perfecter. In doing so, there were two major differences introduced in what became known as the Boehm clarinet (more properly the Klose/Boehm, but let’s not split hairs). On the Boehm version of the clarinet (pretty much set in stone since the 1830’s), the elimination of cross fingerings resulted in the left thumb equals F natural and first finger equals Bb scheme that you know and love. This in turn meant that the two “fundamental scales of the horn” (F major and C major with the register key) were a straight progression up the horn (lifting one finger after another, without any diversions). And, that’s where the Boehm clarinet remains today, with detours like the Mazzeo best left unsaid. Meanwhile, the Mueller clarinet didn’t remain static. 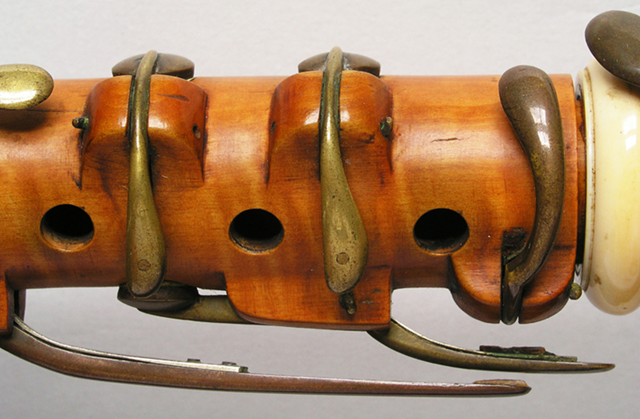 Through various makers, additions were added to the “original clarinet”, mostly as improvements. (One of the major ones, the so-called “patent C#” would be useful on a Boehm horn if anyone offered it.) As these improvements were added, certain makers (including one Albert, a French or Belgian maker) became associated with certain sets and thus was born the Albert “system”. Like Boehm clarinets, Albert horns come in various forms with additional keys, higher quality of manufacture, and so on. Unlike Boehm horns, made by a variety of firms, the “Albert” system, really just a significant improvement to the Mueller clarinet, became associated with just the one firm. At one point, most of the makers made “Albert” horns, including Selmer, Buffet, Noblet, and (I think) B&H. These days, they are seldom made. The last one that I have heard of was a replacement made for Woody Allen. His prized Albert horn cracked through and through, and the manufacturer (do doubt at great expense) produced a new one. Other than that, they are not being made from new these days. But wait, there’s more. Several German manufacturers went a few steps further. One Oskar Oehler took the Mueller clarinet to its ultimate conclusion, creating something that is often called the “Oehler system” in the process. 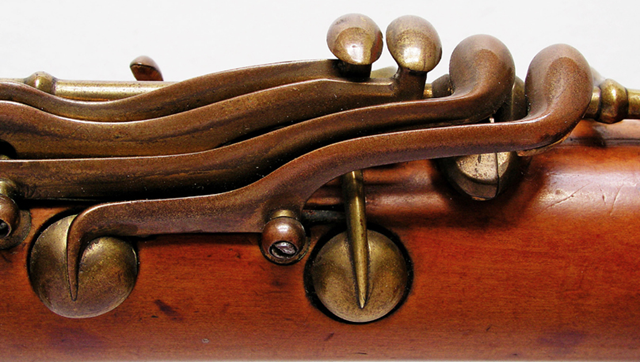 While similar to the Albert horn, the Oehler instruments incorporate extra keys, venting and some perverse “improvements” that have led to a clarinet that is the “same” while at the same time is quite different. On all three “systems”, a Bb is a Bb (on a Bb pitch horn). However, there are differences. One is the infamous sharp facility offered by the Albert/Oehler horns. In effect, it’s easier to play in sharp keys on one, this due to the fork fingerings that are retained (albeit in modified form). There’s no thumb ring on the “German style” horns, and thumb down gives you F#, not F. Ditto the right hand; first finger down is B natural, not Bb. Sort of like the sax on the left hand, but not at all like the sax for the right. The other is the very obvious non-duplication of the little finger keys. Instead, you have the patent C# and a couple of other alternatives. Not as facile as a Boehm, and neither measure up to a full Boehm. And, there are other differences. Bore sizes are different; an Albert blows “more freely” than does a Boehm. The Boehm and the Albert take a different mouthpiece than does the Oehler; the Oehler uses a very tight lay and a very hard reed. Finally, the cost. You can pick up a decent cheap Boehm horn, either student, intermediate or pro, on the secondary market. You can pick up an Albert horn, either student or pro, on eBay, but it’s going to be as old as Methusila, and it will almost certainly require a rebuild. You can purchase a German (“Oehler”) clarinet, in one of many different models, but it’s usually going to cost you a lot more. However, for the last ninety years or so, almost all clarinet players outside of Germany, Austria, Russia and (in part) The Netherlands have been taught on the Boehm. The Albert has slowly faded (except for the occasional outlier like me) until it’s sort of like Welsh – spoken by a few but for the most part ignored. Meanwhile, in their own little Teutonic ghetto, “German style” players keep the Oehler horn (and its simpler cousins) alive and very well. Now, what about the Romero clarinet? Wanna know about that one? Note: The original version of this article was posted on the Bis Key Chronicles.